Hello and welcome to our live coverage of the 45th Volta ao Algarve. 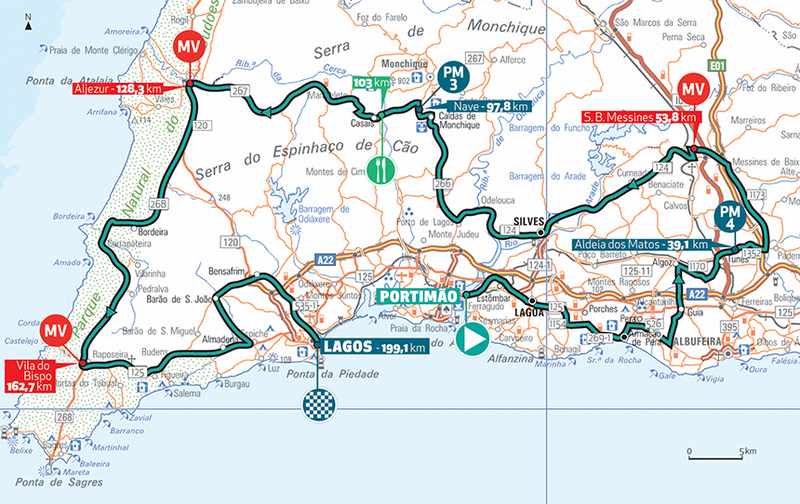 Today's lumpy opening stage – the longest of the race – runs 199.1km from Portimão to Lagos. We're 25 minutes away from the start of the first stage of the race. It's a similar stage to last year's opener, which also finished in Lagos and saw Dylan Groenewegen beat Arnaud Démare in the bunch sprint. The duo return this year, with Groenewegen riding for Jumbo-Visma and Démare at Groupama-FDJ. Other names to look out for later today include Pascal Ackermann (Bora-Hansgrohe), Fabio Jakobsen (Deceuninck-Quick Step), Jens Debusschere (Lotto-Soudal), John Degenkolb (Team Sunweb), Jasper Philipsen (UAE Team Emirates) and Christophe Laporte (Cofidis). Other names to look out for later today include Pascal Ackermann (Bora-Hansgrohe), Fabio Jakobsen (Deceuninck-Quick Step), Jens Debusschere (Lotto-Soudal), John Degenkolb (Trek-Segafredo), Jasper Philipsen (UAE Team Emirates) and Christophe Laporte (Cofidis). Most of those men have already tasted victory in 2018, with Ackermann and Degenkolb winning most recently, on Sunday. Ackermann pipped Marcel Kittel to the line at the Clásica de Almería, while Degenkolb won the final stage of the Tour de la Provence. Groenewegen has a stage at the Volta a la Comunitat Valenciana to his name, while Laporte won two stages and the overall at the Etoile des Bessèges and Philipsen won stage 5 at the Tour Down Under. Meanwhile, Jakobsen and Démare are making their season debuts here. Elsewhere, Astana's Alexey Lutsenko continued his burst of form with a third win in four stages at the Tour of Oman. The Kazakh beat Fabien Grellier (Direct Énergie) and Domenico Pozzovivo (Bahrain-Merida) to triumph on Green Mountain and strengthen his overall lead ahead of tomorrow's final stage. It's Astana's ninth win of the season, with their first coming just ten days ago. And they're off! The peloton has just rolled out for the start of stage 1. The riders will head along the coast before heading inland for much of the stage, later skirting the Southwest Alentejo and Vicentine Coast Natural Park before turning back towards the coast and the finish in Lagos. The peloton has rolled through the neutralised zone and now the race proper is underway. A number of riders from the local Continental teams have gone on the attack. They are Pedro Paulinho (Efapel), David Ribeiro and Marvin Scheulen (LA Alumni-LA Sport), José Mendes (Sporting-Tavira) and Rafael Lourenço (UD Oliveirense/InOutBuild). It's one of the biggest races of the year for these teams, so no surprise to see them fighting to get in the break straight away. The five riders already have an advantage of over three minutes. It looks like this is the break of the day. The gap is up to almost four minutes now. There's still a long way to go until the first feature of today's stage though – the fourth category climb of the Aldeia dos Matos is still 20km away. At the head of the peloton it's Deceuninck-Quick Step and Jumbo-Visma taking up the work, no surprise given the sprinters on the two teams. The race situation is stable at the moment, with no further action reported. Meanwhile, our full report on the Tour of Oman's queen stage on Green Mountain is live and online. The break will be coming up to the first climb of the day soon. The category four Aldeia dos Matos is the first of two categorised climbs today. Paulinho led over the climb. The Efapel man beat Lourenço and Ribeiro to the top. The gap is stable at around the four-minute mark. The first of three intermediate sprints today, at São Bartolomeu de Messines, is up in around 10km. At the intermediate sprint it's Paulinho first once again. Ribeiro and Lourenço follow him across the line. That result means that the Efapel man is now leading both the mounaint and sprint classifications, as well as being the current race leader on the road. The gap back to the peloton has fallen somewhat though – it's now down to 2:40. The riders are descending to the Barragem do Arade, a low-lying dam/reservoir. Then it's flat roads for some time until the second climb of the day at Nave around 38km from now. The gap is stable at around 2:40. Jumbo-Visma, Deceuninck-Quick Step and Bora-Hansgrohe are working at the front of the peloton. The peloton are keeping this break on a tight leash today. The gap is down to 2:20 now. The average speed for the first two hours has been 41.6km/h. The break will be approaching the bottom of the climb soon. The gap remains around the same. Actually, the gap is back up slightly. The break now have a 2:55 advantage. There's still a long day ahead of them before the peloton inevitably brings them back, though. At the top of the second, and final, climb of the day it's Ribeiro who takes the points. He leads Lourenço and Paulinho over the top of the third category climb at Nave. Mendes goes on the attack just after the summit. He's quickly built a gap of 30 seconds to his companions, and 3:30 to the peloton. Ribeiro, Paulinho and Lourenço now all have five mountain points. Ribeiro will wear the leader's jersey on tiebreak tomorrow though, having taken a first and second place on today's climbs. The riders are in the feed zone now. An unclassified climb follows, before they drop down into Aljezur for the second intermediate sprint of the day, in around 25km. Mendes has pulled out his advantage over the remainder of the break now. He's almost two minutes up the road. The peloton is 3:30 back on the Sporting-Tavira rider. It'll be an extremely tough ask for Mendes to last, but at least he's giving it a go. The gaps are getting smaller now. The peloton is two minutes behind Mendes, and only 40 seconds back from the rest of the break. Mendes takes the sprint points in Aljezur. Further back, Paulinho and Lourenço take second and third. Just one sprint left before the finish. That comes in 34km. Mendes' attack has worked out quite well for the peloton. They've caught the remainder of the break and can let the sole attacker hang out from until they reach the sharp end of the race, without the risk of having a larger, stronger group out there. The route to the finish is a little bumpy, but certainly nothing to trouble the sprinters. Sèrgio Paulinho and Antonio Angulo have attacked from the peloton. The Efapel duo have passed Mendes already. The duo have distanced Mendes by 30 seconds, while the peloton lay a further two minutes back. Inside the final 50km now and the Efapel pair have two minutes on the peloton, which is being led by Bora-Hansgrohe, Jumbo-Visma and Deceuninck-Quick Step. They're 2km from the final sprint of the day, with the peloton speeding along 1:30 back now. Angulo takes the (uncontested) sprint ahead of Paulinho. The peloton are just letting the Efapel men hang out there now. 30 seconds with 30km to race. The break's advantage is down under 10 seconds now. It's just a matter of time until the inevitable bunch sprint, barring any disaster. And the break has been caught. Teams are battling for position at the front of the peloton now. Cofidis and Bora-Hansgrohe are maswsed on the front. Sky and Team Sunweb are up there too. Bora are working for Ackermann, Cofidis for Laporte. Meanwhile, Sky and Sunweb don't have a top-tier flat sprinter here. And a quick rundown of the other contenders today. Quick Step have Jakobsen, FDJ have Démare, Visma have Groenewegen, Trek have Degenkolb, Dimension Data have Boasson Hagen, Katusha have Debusschere. The peloton are flying along now, with the same teams up front. It looks near-impossible for an attacker to get away. Jumbo-Visma are up front alongside Bora now. Bora's Pascal Ackermann took his first win of the season at the Clásica de Almería last week, beating Marcel Kittel to the line. The German team clearly have full faith in him to deliver again today. Big pileup in the middle of the peloton. Around 40 riders seem to have survived at the front. Groenewegen is one of the riders caught up. Several Jumbo-Visma riders were waiting around at the crash site. Degenkolb was also caught up in the crash. The crash began with a touch of wheels between a Trek and Jumbo rider towards the front of the peloton. Trek-Segafredo are leading the group of surivors. It looks like they're riding for Edward Theuns. Most of the other top sprinters – Groenewegen and Degenkolb aside – are up there. Final kilometre now! Quick Step on the front. Bora hits the front too. It's a very long sprint from Philipsen!. Jakobsen takes it up in the final 200 metres though. And Jakobsen comes through to take the win! It was a messy sprint after the Quick Step leadout seemed to break down. Jakobsen found the right wheel and opened up a gap on Ackermann early. The Quick Step man eased past the fading UAE man, while Démare and Ackermann rounded out the podium. There were no barriers until the final 2-300 metres. Not the best from the organisation. Consonni was fourth, while Jasper De Buyst (Lotto-Soudal) took fifth. Jakobsen, of course, takes the race lead with this stage win. 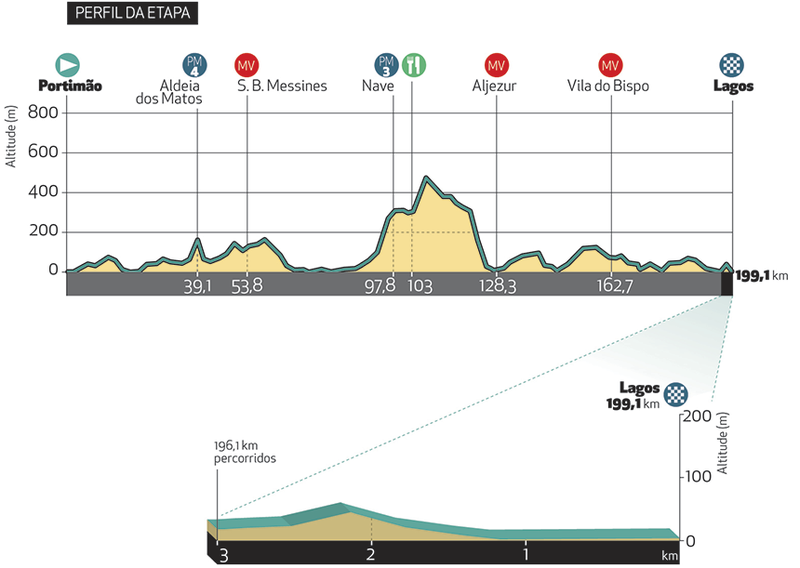 It should be all change tomorrow with the uphill finish on the Alto da Fóia. We don't yet have the full results, but a number of strong climbers avoided the crash and finished with the sprinters today. They'll be among the favourites to take over the GC tomorrow. Neilson Powless (Jumbo-Visma), Wout Poels (Sky), Tadej Pogačar (UAE Team Emirates), Sam Oomen (Team Sunweb), Enric Mas and David de la Cruz (Deceuninck-Quick Step) are the potential GC men who didn't lose any time today.